The Reputation of Muay Thai as a ruthlessly effective martial art is second to none. The footwork of Muay Thai is at the foundation of what makes it such an effective and devastating martial art for stand-up striking. Did you know that no matter which weapon you throw – Punch, Kick, Teep, Knee or Elbow Strike – the power generation of your weapons ALWAYS starts from your feet? Muay Thai is a legacy of the Thai people and the power contained within this Thai Martial Art is retained and passed down through the deep wisdom contained within the Muay Thai curriculum itself. This book aims to simplify the Art of Muay Thai by breaking down the art into footwork movements anyone can learn. The entire Muay Thai system of fighting is based on learning the footwork. Just like there are 26 letters in the English alphabet which are used to create words and sentences, there are 19 footwork movements of Muay Thai which are at the literal foundation of all the basic strikes, blocks, offensive combinations, and counter-attacks of Muay Thai. 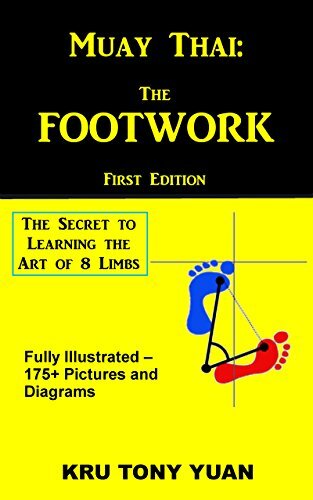 By reading this book, you will learn how these footwork movements are at the foundation of the Muay Thai fighting system and how to apply the footwork to your own fighting repertoire. +170 photos and diagrams for learning the art of Muay Thai – through the lens of the Footwork. The Art of Muay Thai – Decoded! The most basic and advanced Authentic Muay Thai techniques, all learned from the perspective of the footwork – step sequences that anybody can learn and understand – child or adult! Learn what ‘Chawk’ footwork is, and how Thai fighter’s use this evasive footwork to neutralize their opponents attacks to set-up up their own counter-attack. Learn the difference in how to generate power for your elbow strikes when stepping forward vs. throwing the elbows in place. Improve your Fighting Intelligence. Learn how to think about the game of Muay Thai – in terms of rhythm, broken down into series of step sequences. Learn the origin and history of Muay Thai and the cultural aspects hidden with the names of the Muay Thai techniques, drawing upon the imagination and culture of the Thai people to preserve the Art. This book aims to simplify the art of Muay Thai for English speaking students who are looking for more than how to just kick or punch, but really looking to expand their knowledge of the art to a Deeper Level. If you’ve been training Muay Thai for a while, nothing in this book is new or revolutionary. It discusses all of the basic weapons, footwork movements, blocks, catches, parrys, offensive combinations, and higher level counter-techniques – through the lens of the Footwork. You might be someone who has reached an intermediate level of Muay Thai and searching to improve your sparring game. This book will open your mind to the various steps at the disposal of a Muay Thai fighter, allowing you to think new possibilities you can set-up off your footwork. You might be a Muay Thai instructor looking for an effective method for teaching the art of Muay Thai to your students. Reading this book will help you teach by helping you to crystallize the basic concepts of Muay Thai in clear and concise language that will work for beginners. Or if you are new to Muay Thai, this book will give you that mental edge in training to really improve your fight intelligence from the start, so that you can learn quicker and spend less time figuring out the nuances of this rich and mystifying art.